경주시 황남동 미추왕릉 지구에 있는 신라 무덤인 황남대총에서 발견된 유리제 잔(배)이다. 황남대총은 2개의 봉분이 남·북으로 표주박 모양으로 붙어 있다. 황남대총 북분 유리잔(皇南大塚北墳 琉璃盞)은 높이 7㎝, 구연부 지름 10.5㎝로 북쪽 무덤에서 출토되었다. 구연부 부분은 수평이 되도록 넓게 바깥쪽으로 벌어졌고, 몸통 부분은 밥 그릇 모양으로 밑이 약간 넓어진다. 아랫부분에는 우뚝한 받침이 있는데, 짧은 목을 거쳐서 나팔형의 굽이 달렸다. 유리는 투명한 양질이고 갈색으로 전체에 걸쳐 나뭇결 무늬가 있다. 받침 바닥에 약간의 손상이 있는 외에는 완전한 형태로 보존되어 있다. 경주의 신라 무덤에서는 여러가지 종류의 유리제 용기가 발견되었지만, 이러한 작품은 처음 보는 독특한 예이다. 잔의 모양이나 무늬로 보아 신라 제품이 아닌 서방에서 전래된 것으로 추측된다. Hwangnamdaechong Tomb, or the Great Tumulus of Hwangnam, is a Silla tumulus located in Hwangnam-dong, Gyeongju, Gyeongsangbuk-do. The Gyeongju Tumuli serial number is Hwangnam-dong tumulus no 98. It was excavated and researched by the Office of Cultural Assets in 1973 and 1975. Today the outward form of the tumulus has been restored. Two mounds connected north and south to give it the shape of a small gourd. It is the largest mound from the Silla Period. Its breadth is 80m east-west, 120m north-south. The height of the south tumulus is 23m and that of the north is 22m. It is the largest of the Silla Dynasty mounds. 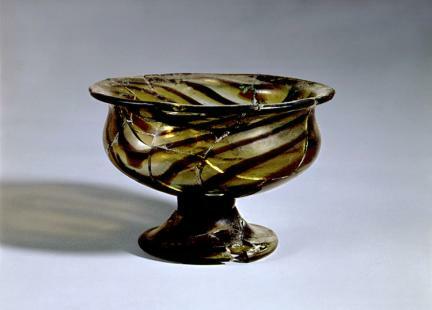 The glassware cup was excavated from the north mound of Hwangnamdaechong. It is 7 cm high, and it has a thick rim that is rolled horizontally outwards. The diameter of the rim is 10.5cm. The body of the cup is shaped like a bowl with a wide bottom. Under the body of the cup there is a prop with a short neck and a bell shaped foot. The glass is transparent and of good quality. It is brown with a leaf pattern scattered all over. Except for a little crack on the foot the cup is wholly preserved. From the Gyeongju Tumuli of Silla, various kinds of glassware were excavated. However, this glassware cup has singular features. By the shape of the cup and its pattern, it is likely that is was introduced from the west, and is not a product of Silla.